On twitter, where I probably spend too much of my time, Dave Winer suggested that start-ups write about themselves, thus cutting out Tech Crunch as the middle man. Since Dave wrote the original blogging software and the first blog on the Internet (really! ), his advice is worth considering. So, this week is all about our progress. The most important thing to know is – we finished our pilot test and it works. 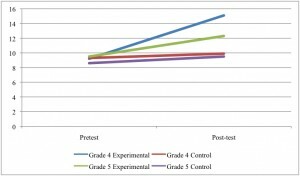 As you can see from the graph, both intervention groups increased substantially more from the pre-test to the post-test than did the control group. The reservation had exactly two schools. One was our control group which simply got tested on specific math concepts and then tested again eight weeks later. The other group played our game over the eight week period. Not continuously because there was a break for Thanksgiving and a mid-way break we had planned to do updates. So, after about six actual weeks of hands-on, the kids math scores went up. We did a repeated measures Analysis of Variance and the time by group interaction effect was significant – meaning there was a statistically significant improvement for our group that played the game. You might wonder (if you were a statistician) if there was an interaction with grade. There are a couple of possible reasons why the fourth-grade did better. One is that the whole class used the game, in their classroom (we provided laptops). The fifth-graders were pulled out of their classroom and only five from each class participated. Also, the fourth-grade teachers, on their own initiative, got much more involved and used the supplemental materials we provided them, increased their own time spent teaching math. Looking at teacher effects and the effect of whole-class versus pull-out instruction are two things we will be doing next. Do you intend to repeat the study. Could you point me to some links that explain what the Native American Game is that you are playing with the kids? Yes, we are repeating the study with several more schools beginning this fall, and adding schools through the 2013 and 2014 academic years.